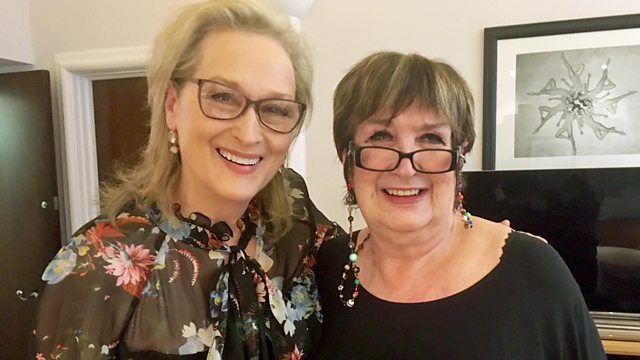 Award-winning actor Meryl Streep on her latest film, The Post, and Sigrid - winning act of BBC Music Sound Of, 2018. Plus Joanna Cannon on her novel about friendship and mortality. Hollywood star Meryl Streep discusses her latest film The Post, telling the story of the days leading up to a decision by The Washington Post to publish extracts from the so-called Pentagon Papers in 1971. The 7,000-page top secret report exposed damming government secrets about America's involvement in the Vietnam War that spanned three decades and four US Presidents. Tom Hanks plays Post editor Ben Bradlee while Streep stars as Katharine Graham, the paper's publisher and the first female CEO of a Fortune 500 company. What's her take on how much power is shifting towards women in a post-Weinstein Hollywood? Sigrid, winning act of the BBC Music Sound Of 2018 shortlist announced on air - a list that has launched the careers of Adele, Ellie Goulding, and Florence + The Machine. She performs her single Strangers. The equivalent of one child every 49 seconds is referred to children's services, according to the Local Government Association. Alison Michalska is president of the Association of Directors of Children's Services - why are so many referrals being made and are councils able to cope? Joanna Cannon, author of The Trouble with Goats and Sheep, has written a new book, Three Things About Elsie - a novel about old age, memory loss, friendship and mortality . The main narrator is 84-year-old Florence who lives at Cherry Tree Home for the Elderly but is being threatened with a transfer to Greenbanks where nobody wants to go. Florence is seen as "difficult", she has holes in her memory but she also has a mystery to solve.